The Howard Berger ceiling-mount quartz heater (CZQTV5M) is another heater that runs on electricity. It weighs 7.6 pounds, has an adjustable halogen light, and is advertised to have two heat settings. Since it’s powered by electricity and it’s ceiling-mounted, some consumers use this outdoor heater indoors or in an enclosed setting (such as a garage), and others use it to help provide heat outdoors. 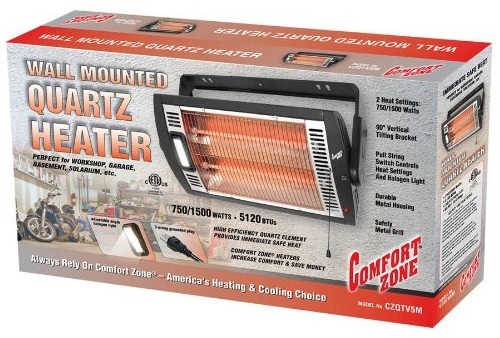 In this Howard Berger heater review, we’ll give you more details and feedback about this quartz heater. This heater does not heat the air around you. Instead, it heats OBJECTS, which include you, situated in front of it. This heater comes in a metal housing. The color of the unit is what you see in the picture – black (outside) and silver (inside). It comes with two heat settings of different wattage – 760 watts and 1,500 watts. The element turns red when you power it up using the pull chord. The pull string switch controls the heat settings and the light. When you pull it once, it turns on the light. Pull it again and it turns on the first heating element (760 watts). Pull it the third time and you’ll turn on the other heating element (1,500 watts). Since this is ceiling mountable, you’ll need to spend time on installation. – Installation. Although several consumers say that the Howard Berger quartz heater is quick and simple to install, you may have to make some adjustments to make sure it works. For instance, it’s advisable that you mount it near an outlet because instructions say you shouldn’t plug it into an extension cord. Also, you might find that the mounting bracket is not that sturdy to hold the heater. – Amperage. Several consumers report that this unit draws 12.5 amps at 120 volts and at 1,500 watts (high setting). Meaning, it can blow up a 15 amp circuit if you use an appliance of the same amp/ power draw at the same time. – Pull String. Some consumers are not happy with this heater’s pull string and would have preferred a button instead. That’s because the pull string can get broken as others have experienced. And although the string can be replaced, it requires that you take out some of the heater apart, as one buyer has said. – Halogen Light. As previously mentioned, the pull string controls the light and heat settings. The drawback or limitation is that the light stays ON at all times. Meaning, to use the heater, you automatically turn on the light. This can be annoying, so as one buyer has suggested, a quick fix is to take out the bulb. – Inconsistent Advertisement. This ceiling-mount heater is advertised as “able to mount on a WALL or CEILING.” At least three consumers say that the instructions say it is only for ceiling. – Output. There are conflicting feedback as regards the heat output of this heater. But considering that this heater does not heat the air and instead warm the object in front of it, the output can be measured by proximity. For instance, one consumer originally mounted this heater 10 feet above his workbench and was not satisfied with the warmth. He head to adjust it to 7 feet to finally feel considerable heat. Contrary to what was written on its product description, the Howard Berger heater is only ceiling-mountable. Since this type of heater warms the object rather than the air around you, you may have to be close to it — but not too close, lest you’ll get burned — to feel warm. Overall, this is more of a “space heater” or a “close proximity spot heater” rather than an overall air heater, to echo a consumer’s feedback. Learn more about the Howard Berger heater here. Or continue reading our review of a similar product, the FireSense 60660 hanging halogen heater.